Keto Bagels Recipe - #1 Low-Carb Version - Delicious Soft & Fluffy! 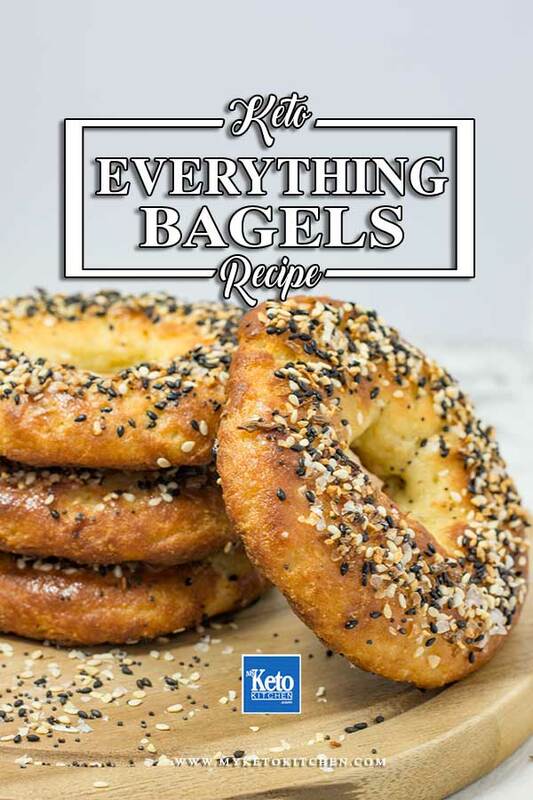 Home » Recipes » Keto Bagels Recipe – Low Carb Delicious Soft & Fluffy! Keto Bagels Recipe – Low Carb Delicious Soft & Fluffy! Our Keto Bagels Recipe makes perfect rolls every time! It’s all the flavors of your favorite everything bagel without the carbs. 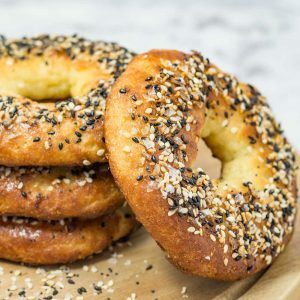 This bagel recipe is a modified version of our Keto Pretzels and topped with our Everything Seasoning. Make sure that your keto bagel holes are a little bigger than what you think they need to be. These low-carb bagels will rise as they cook, and the holes can close up if they are not wide enough. Why do we use inulin? 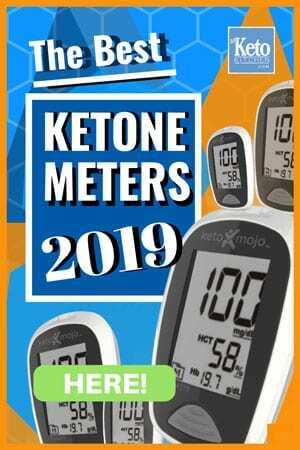 Inulin is a low carb substitute that works the same way sugar does when proofed with yeast. 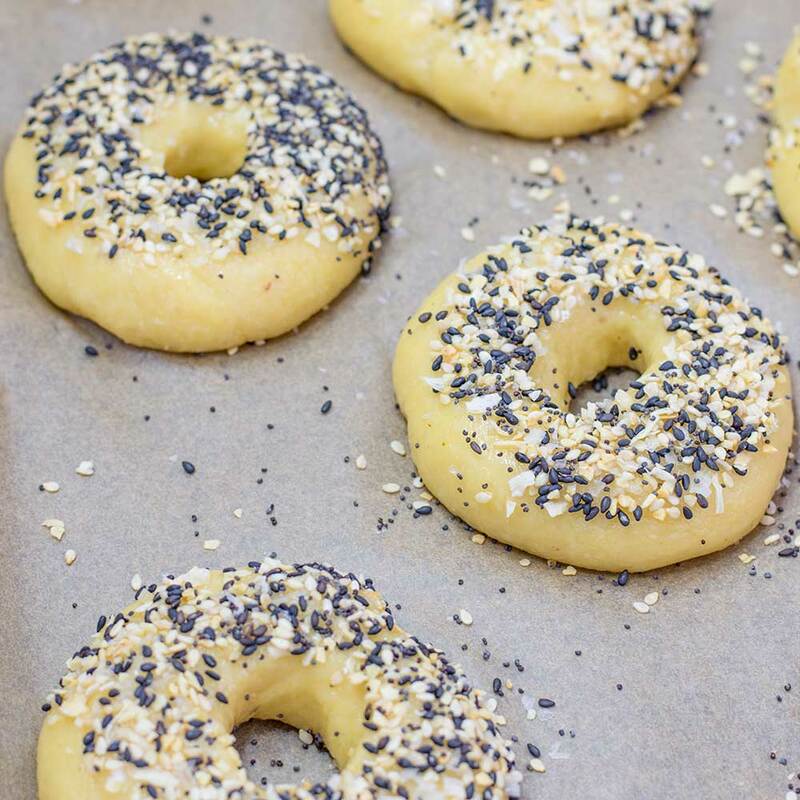 Yeast needs food to work properly and get the rise needed for these low-carb bagels in the absence of sugar. 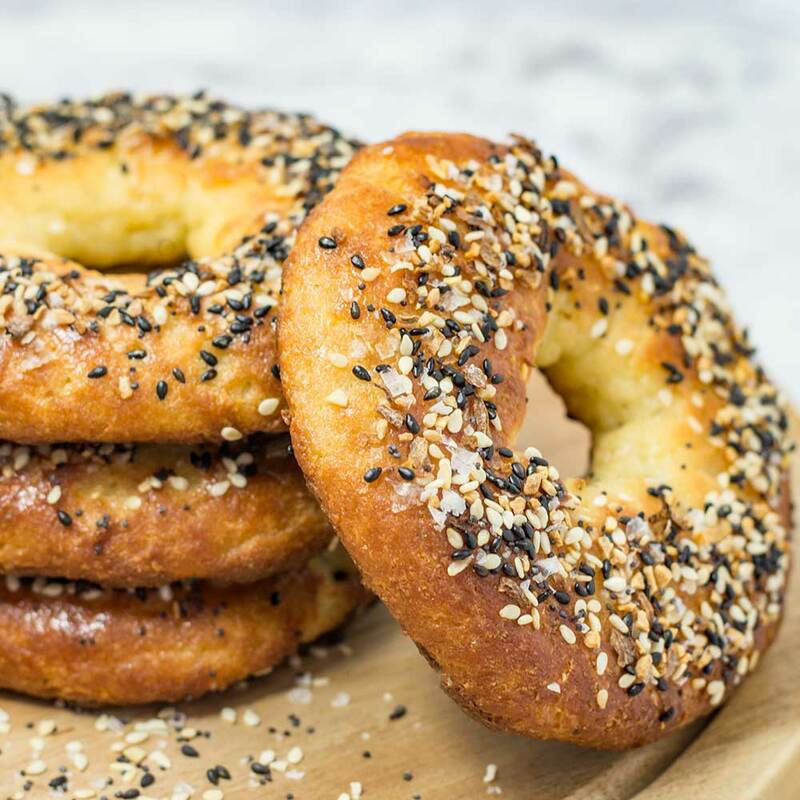 This keto bagel recipe is also gluten-free and makes 8 serves. 1 serving is 1 bagel. Store your low-carb keto bagels in the fridge for up to 3 days. In a large mixing bowl, add the yeast, inulin and warm water and set aside to proof. Melt the mozzarella and butter until it’s completely melted. This can be done in the microwave or in a saucepan on the stove. Once the yeast is foamy, add the almond flour, baking powder and xanthan gum and mix well. Pour over the hot melted cheese mixture and mix into the almond flour mixture, when it’s about halfway mixed, add 2 of the eggs. Continue mixing until you have a slightly sticky dough. I highly recommend mixing the dough with gloved hands for the best results. Set the dough aside and prepare a large cookie sheet by lining with parchment paper. Set your oven to 180C/355F. Split your dough into 8 evenly sized pieces. Ours weighed out between 75-80g/2.6-2.8oz. Roll each piece of dough into a ball, then poke your finger through the middle to make an opening. To make the opening a wider, gently spin the dough around your finger like it’s a tiny hula hoop. Place your bagel on the lined cookie sheet and repeat step 8 for the remaining dough pieces. Crack the extra egg into a small bowl and beat well. Spread your Everything Seasoning on a plate, ready for dipping. Gently brush each bagel with egg wash then press into your seasoning. Place it back on the cookie sheet and continue with the other bagel. Once all the bagels are seasoned, leave in a warm place for 15 minutes to proof. Bake in the oven for 15-20 minutes, until browned. Remove from the oven and leave to cool for 10 minutes before enjoying. Once the yeast is foamy, add the almond flour, baking powder, and xanthan gum and mix well. Low Carb Everything Bagels. Delicious gluten-free, grain-free bagels ready for a healthy lunch or breakfast. 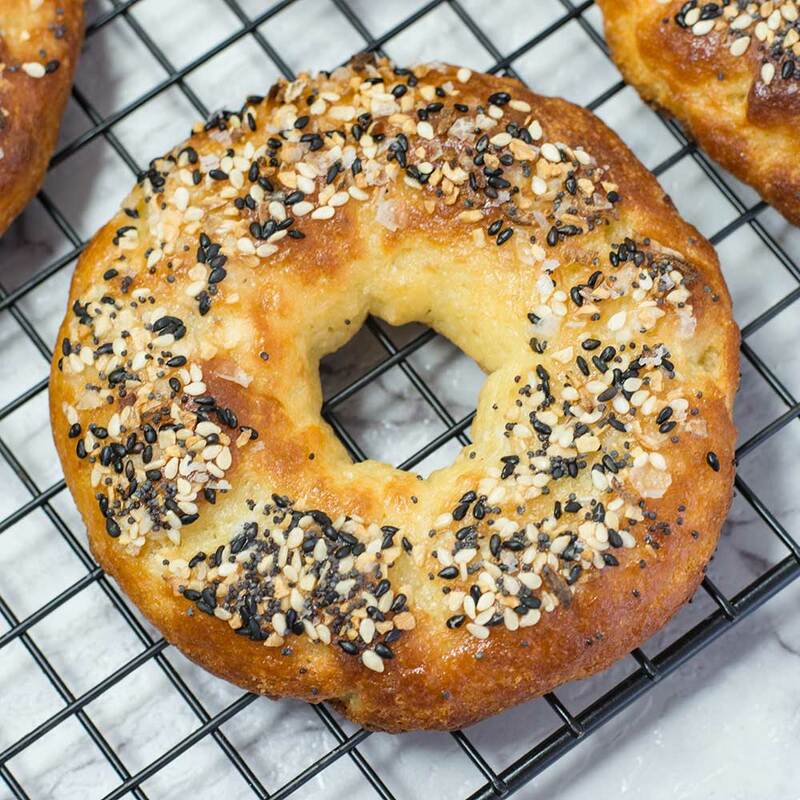 To make a larger batch of this Keto Bagels recipe adjust the servings above.